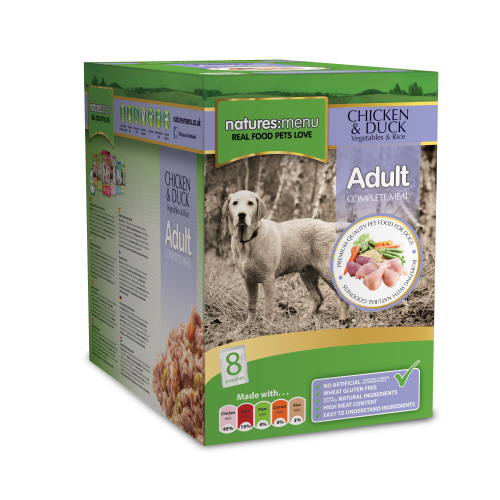 Natures Menu Chicken & Duck pouches are a delicious, natural, & complete dog food made with fresh chicken, game meat and vegetables. Free from artificial colours, flavours and preservatives, each pouch is filled with quality raw ingredients before being sealed and gently steamed, ensuring all the nutrients are locked in tight. Free from common fillers like wheat, corn, bran, and soya, Natures Menu pouches contain a minimum of 60% meat – and no meat derivatives. With Chicken as an abundant source of essential amino acids to help maintain and repair muscles, as well as delicious dark duck meat, a hypoallergenic protein source, ideal for dogs with intolerances to some common ingredients. Chicken (min 45%), Duck (min 15%), Peas (min 4%), Carrots (min 4%), Rice (min 2%). Protein 9%, Crude Oils & Fats 6%, Crude Ash 3%, Crude Fibres 0.5%, Moisture 77%.